California duo Capital Cities are all over the radio with their multi-format smash “Safe And Sound”. It’s worth noting that the act’s name is pretty unusual, but I guess that could be said of a lot of groups nowadays. Fact is, Ryan Merchant and Sebu Simonian are based out of Los Angeles, which is the biggest city in California, but isn’t the capital of it. That would be the much smaller Sacramento. That got me thinking about all of the capital cities in the United States and how well they’ve been represented by both top 40 artists and singles on the national music charts. As you might expect, it’s not that fairly distributed but it’s still an interesting look. Luckily, you don’t need a map for this one; I’ll be happy to map it out for you. Founded in Doraville, GA in 1971, the Atlanta Rhythm Section took their Southern rock sound onto the charts in 1974 with their debut single, “Doraville” (#35). 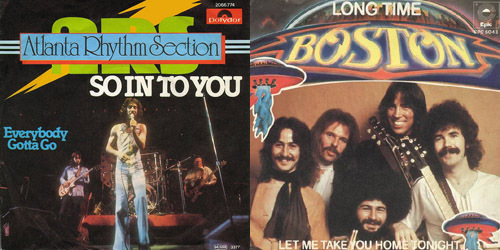 Seven of their songs made the top 40 on the Hot 100, including two #7 singles: “So Into You” (1977) and “Imaginary Lover” (1978). They last charted in 1981 with a release that’s gone obscure, but are still active on the live circuit. They haven’t recorded new material since the late 90’s. The only song about Georgia’s capital to make the top 40 did it in the fall of 1981. After his departure from Jefferson Starship, Marty Balin‘s “Hearts” became a top ten single, followed by the #27 entry “Atlanta Lady (Something About Your Love)”. After one more minor single in 1983, his chart days were over. Aerosmith and New Kids On The Block may have the bigger selection of hits, but how can you not love a band from Boston called Boston? The group led by the late Brad Delp burst onto the charts in 1976 with singles like “More Than A Feeling” (#5) and “Don’t Look Back” (#4) two years later. After much delay, their Third Stage album in 1986 provided them with the #1 hit “Amanda”. They still perform today with a different set of members. Two songs name-checking Beantown also made the top 40. In 1974, “Please Come To Boston” became the first and only big single for Tenneessee born Dave Loggins. It went to #5. A followup release only managed a peak in the 50’s. Then, in 2007, Augustana slowly rose up to a peak of #34 with their first charting hit, “Boston”. They also charted only once more with a minor peaking single and have gone through a few lineup changes since then, though they appear to have a new record deal and album in the pipeline. The only group with the Tennessee’s capital in their name didn’t grow up in the United States at all. The Nashville Teens were based out of Surrey in the southern part of England. Their claim to fame was the 1964 hit “Tobacco Road”, which went as high as #14. “Find My Way Back Home” barely scratched the Hot 100 the following year, but they continued to record material into the early 70’s before splitting. Also in the 60’s, “Nashville Cats” became a #8 single for quintet The Lovin’ Spoonful in 1967. Though it was far from their biggest release on the charts, the #1 “Summer In The City”, it was their sixth and last time charting in the top ten. They would be off the Hot 100 altogether by 1969, when the group parted ways. For more chart chronicles that put the top in topography, follow the blog below or find me on Twitter: @AdamFSoybel.